Nielsen owes much to the work of Robert Simpson especially while he was at the BBC. Did Simpson also play a role in bringing about the playing of the Fifth Symphony at the Edinburgh Festival in 1950? I still recall the BBC paperback (1965) in which he analysed the music of Nielsen and Sibelius back to back. 1965 was centenary year for both composers. Nielsen's more modest revival might also have been partly as a result of riding on the shoulders of the Sibelius wave that rose and has continued to rise, crest and break from the mid-1960s onwards. Interestingly, while Sibelius long outlived his Danish contemporary, had he died in the same year as Nielsen all the major works would have been completed; nothing substantial lost. The warm analogue CBS recording announces itself right from the first note of the First Symphony. Of course the sprightly winds and rich strings and brass of the Philadelphians help greatly in what is, by any account, a grandly committed performance. The same can be said of the Ormandy Sixth - the most enigmatic of the set rather like Vaughan Williams' Ninth. Ormandy disentangles the strands and presents the spare work with the clarity called for in a symphony that rejoices in chamber textures. The first of the Bernstein readings follows the First Symphony. The Nielsen Second Symphony is given with bull-nosed enthusiasm by the NYPO. In comparison with the Ormandy version of the First Symphony the strings in particular sound a mite shriller and less amply toned. This is surely a function of both recording quality and intrinsic sound; that fierceness that Bernstein cozened from his orchestras. The lift and exultation of the Allegro sanguineo and the Allegro Colerico both show Bernstein at his short-fused best. Similar qualities (both positive and negative) run through Bernstein's New York Inextinguishable. The woodwind 'choir' is however far more agreeably presented in this symphony than in Number 2. The Third Symphony is strong and its sound, if a shade acidic, is ample and full-toned; perhaps a little one-dimensionally forward but very agreeable. The Third does not suffer from the thinness that afflicts the Bernstein second. The woodwind are pert and the strings silvery or of golden weight. On this basis it is a shame that Bernstein chose to go back to New York to record the other symphonies. You do adjust to the New York gleam however but it is all rather dazzling in the Second Symphony. The confident radiance of the finale of the Fourth Symphony put me in mind of Martinů's Fourth Symphony - especially its finale. I had not thought about this until now but what a pity that Bernstein did not feel interested enough in the Martinů symphonies at least to record the Fourth. I love the Fifth Symphony. It is the work which, with the Third, acted as the key to explore everything else. Bernstein is great in this. From the hushed whisper-chatter of the opening to the carolling French horns and the side-drum onslaught I rate this a total success. Indeed the Nielsen 3/5 coupling on a single midprice CD was always one of the winners in the CBS/Sony catalogue. Bernstein steers the famous central four symphonies using the NYPO for 2, 4 and 5 and the Royal Danish for the Espansiva. These have been available for many years on single mid-price CDs and five or so years ago all the recordings on this set were issued with the concertos and various shorter works in a Sony four CD set. 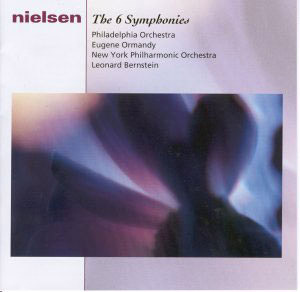 Ormandy and the 'Fabulous Philadelphians' provide the outward-flanking symphonies - Alpha and Omega. The notes, in English only, are by Norbert Bolin. My only real criticism of the notes is that significant Danes such as Louis Glass, Haakon Børresen and Rued Langgaard are not mentioned at all. It is a shame that details of the recording dates and locations are not included. Given that four Bernstein recordings form the preponderance of this release I hope that this augurs the appearance of Bernstein's seven Sibelius symphonies. That set has been in currency on French Sony for a couple of years now but has not been available through US or UK outlets. Another augury for the continual low-key spill of Sony releases may be that the Nielsen wind concertos would make a nice single disc issue filled out with various recordings of the shorter orchestral works. This set would not perhaps be a first choice. For that I would go to the Ole Schmidt set on Regis (similarly at bargain price). Beyond that I would try for BIS and the Decca San Francisco version conducted by Herbert Blomstedt. Other alternatives include cycles either complete or ongoing from ClassicO (Bostock and the RLPO) or Da Capo (Schønwandt/DNRSO). Nielsen has been fortunate in his discography. If perhaps you have found other cycles rather bland you should come to this one (knowing that your investment will be small) for brimming character. Do not have fears for chromium plated American heartlessness. Of yield and heart there is no shortage in these readings. These are superb versions of symphonies 1, 3, 5 and 6 in analogue sound getting on for forty years old. This is not perhaps a first choice but a radiant alternative for those open-minded enough and seeking a golden age outside the Danish vintage. Audio miracles have been wrought to make these recordings sound as good as they do here. The illustrations of this are in the grumpy fantasy of the Tema con variazioni of the Sinfonia Semplice and in the pastoral spells of the Sinfonia Espansiva.